Going soy free is a pain. You think you're good other than the obvious, but then you start reading labels and realize that everything from Miracle Whip to salad dressings, bread and almost every kind of crackers, or cereal have either soybean oil or soy flour in it. Packaged food is fairly easy to give up, although now and then we whine that something we love is now on the "do not consume" list. Oreos? Totally out. Kevin was SO SAD. The one casualty of the new soy and corn free diet is Asian food. It's pretty hard to make Asian dishes without soy sauce-what about stir fries, sauces, and more? They all have soy! We struggled a little and I read a LOT of labels, but couldn't find anything. 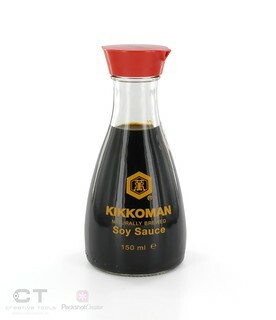 There is soy free soy sauce out there somewhere, I've been told, but in all my searching I haven't found it. Many people have suggested Bragg's Liquid Aminos to us, but what they don't realize is Bragg's is made with non GMO soy. So it is good if you are avoiding GMO food, but it's still made of soy. At any rate, I wanted to make salad rolls and was trying to find a dip for them. Every Asian sauce I found had soy in it, until I finally stumbled across this recipe for a soy sauce alternative in the Times Colonist. After trying it I can say that it's really easy to put together, and while it doesn't taste exactly like soy sauce, I think it's a good alternative. You can adjust the amount of salt in it, which is good for us as we always found soy sauce too salty anyway. In a recipe such as the peanut dipping sauce for our salad rolls, it was perfect. I've thought about adding Worcestershire (Lea and Perrins is soy free) or a splash of sake, but we'll see. I can't wait to try it in other uses and see how it turns out. Mix the beef stock, balsamic vinegar, cider vinegar, and molasses together in a small saucepan and bring it to a simmer. Turn the heat down and continue to simmer it until the mixture is reduced to 2/3 of a cup. Stir in the pinches of pepper, garlic powder, ginger, and salt. Cool and store in a jar with a tightly sealed lid. The sauce will keep in the fridge for about 10 days.